In an effort to serve you better, my wife & I are planning to attend an annual convention (out West) in June, designed specifically for independent owners of pack & ship stores. For 4 days, we are looking forward to be immersed in training, certification (for packing & freight), breakout sessions with shipping industry leaders and networking with other successful business owners. So, during this time of our absence from GI, we have to close the store. I’m providing this notice in advance so that you can mark your calendars and tell others as well: We will be closed from June 3rd to the 9th and will reopen on Wed, June 10th at 10 AM (keep in mind that summer hours are in effect after Memorial Day, so we will be opening at 10 AM (instead of 8:30) beginning May 26th). I’m very excited for this new growing opportunity, so that I can continue to serve the community better by offering more services and perfecting existing ones, with excellence, effervescence and mirth of course! Thank you for your continued support and please help me spread the word about this upcoming closure (i.e. taking 2 steps back in order to take 4 steps forward). Save time and hassle by using our package holding service, especially during the holidays. I received a call yesterday from a distressed client, whose husband ordered a Christmas gift for her, and because no one was home to sign for the package (on the 3rd delivery attempt), the box was being returned back to the sender. After 3 hours and 4 phone calls, she was able to pick up her package at the nearby Niagara Falls UPS Facility. Please don’t let this situation happen to you. Use our package holding service! Just make sure the name on the package is yours and the address (including company name) is our address (1879 Whitehaven Road, Grand Island, NY 14072). Many Canadians and fellow Grand Islanders use this service already, but I felt that I needed to remind you once again, especially during the holidays, to take advantage of this useful service. For only $2.50 per box, we will receive, hold and sign for your package at our location. You can pick it up at your convenience within a week from our store. No hassles, no headaches and no going off the Island! Please share this post and information with others, to help make their lives a little easier and less stressful, especially during the holidays. Thanks for your help today with my problem. It only took four phone calls and THREE hours of waiting to hear back from UPS, but they were able to retrieve the package (my Christmas gift from hubby) before it got returned to the sender. He will be able to pick it up at the Packard Road center tonight. What a mess and a wasted day, all because the driver did not ring my doorbell this morning! For the past 3 years, as we get closer to the holiday season, I get a lot of calls and emails from clients asking me if their package was being held at my store because they received an email from FedEx (or UPS or USPS), alerting them of an attempted delivery. “We have received reports of fraudulent emails with the subject lines “Shipping Conformation,” “Verify Info,” “Some important information is missing” and “Please fulfill the documents attached to verify your identity.” The fraudulent email may have an attached file that may contain a virus or other malware. So, if you receive an email like that, DON’T OPEN IT! First, call me at 773-6300 and let me know the email matter. 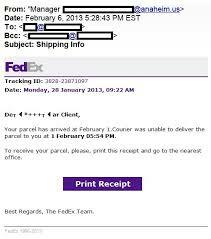 If the “Sent from” email address is other than from @fedex.com or @ups.com or @usps.com, it’s probably spam or junk! Be safe with your emails and thank you for your trust. Please feel free to share this post with your friends, family and relatives.